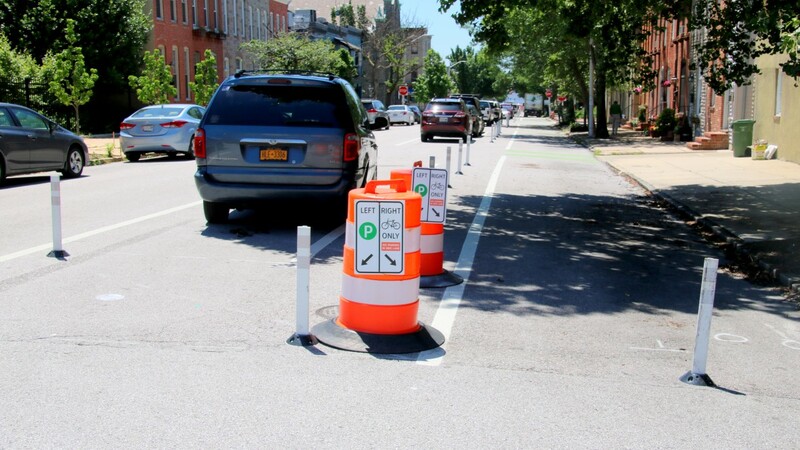 Calls poured into City Hall, and online comments came in hot and heavy, from Baltimore cyclists incensed by the city’s decision to halt the installation of a new protected bike lane in Southeast Baltimore. Meanwhile, on Potomac Street, where the city has been installing the lane, Spence Daw said he welcomed the decision. The new lane, which reduced the space for moving car traffic from two lanes to one lane, had made it “kind of a pain” to pull out of the alley from the garage behind his house. But for Eleana McCann, all that racing and swerving on this residential Canton street is the problem – one which the new bike lane had been solving. A mother and a runner, McCann said she liked how speeding has subsided since the city began installing the bike lane. Across the city, cyclists are livid over Wednesday’s disclosure that the city would be reconfiguring the Potomac Avenue “cycle track” because it does not meet city fire code regulations calling for 20-foot-wide street clearance. So far, nearly 600 people have used the online form provided by the advocacy group Bikemore to tell Mayor Catherine Pugh they oppose her decision, according to Liz Cornish, the group’s executive director. “It saddens me that the person in the top position of leadership in our city is so spineless as to bend to the will of a small faction of residents,” one of those opponents said on the mayor’s Facebook page. “Does Pugh have a strategy or does she just react to the loudest voice?” another chided. A man who lives near Potomac – and described himself as “fighting this thing from Day One” – saw it differently yesterday. “How’s a fire truck supposed to make that turn?” he said, pointing to the Foster Avenue intersection. “How are we supposed to park in a thing like that?” he said, pointing to the “floating lane” in front of a line of rowhouses. “I can’t wait to get out of this city and be around normal people,” he added, declining to give his name but describing himself as a Trump supporter, a legal gun owner and a longtime city resident. Copies of the mayor’s two-page announcement had been tucked into screen doors and mailboxes on Potomac. One was lying on the grass. The man said he’d gotten his at the bar on the corner. In a letter signed by James T. Smith, Jr., the mayor’s chief of strategic alliances, the decision was described as a safety issue. “Mayor Pugh is committed to making Baltimore a bicycle and pedestrian-friendly multi-modal City, while at the same time ensuring that changes made to our roadways do not have serious negative safety and emergency response implications,” the letter said. 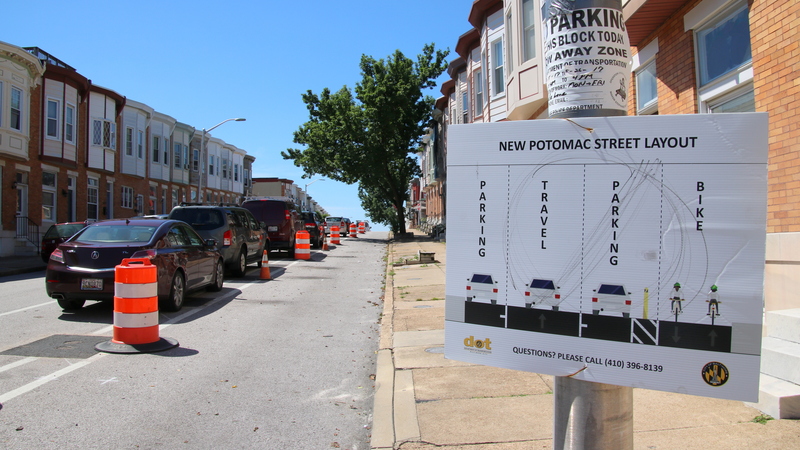 “The current bike lane installation on Potomac Street provides for a fire apparatus access road that is less than is called for by the Baltimore City Fire Code,” Smith wrote. Smith apologized for poor “communication and coordination” and “any inconvenience” caused by the project, which Cornish said is about 75% completed. • On the section of Potomac Street between Eastern Avenue and Fait Street, curbside parking will be restored. 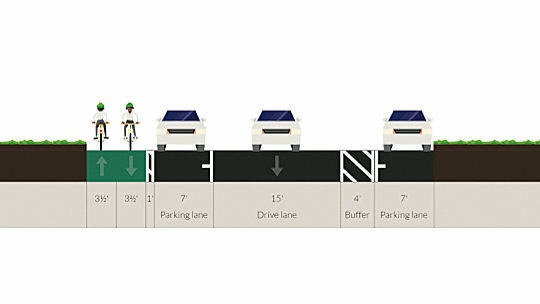 There will be an 8-foot-wide, two-way bike lane separated from traffic and parked cars by an 18-inch buffer on either side. • On the southern end of Potomac, from Fait to Boston streets, curbside parking is not restored. 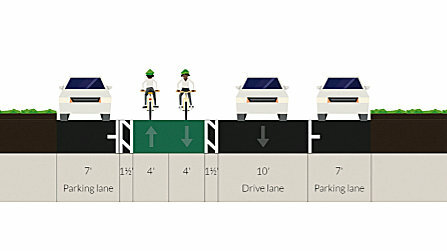 But the bike lane will be narrowed to 7 feet wide, with a one-foot buffer separating it from the “floating” parking lane. Cornish and other bike advocates said they fear the announcement means that years of gains for cyclists are in jeopardy, including the Downtown Bicycle Network, a planned 10-mile array of two-way protected lanes and other kinds of bike infrastructure. She said the Potomac Street Cycle Track represents a $200,000 investment by the city, mostly using state and federal funds. The group’s immediate concern is halting the proposed reconfiguration of Potomac, which Bikemore policy director Jed Weeks called unacceptable. “We’re getting into fairly ridiculous territory here,” Weeks said. The Potomac Street design was “an all-ages high-quality protected bike lane consistent with the city’s NACTO [National Association of City Transportation Officials] Urban Bikeway Design Guide,” he said. It was the product of years of discussions among advocates and city transportation planners. Now, Weeks said, the 18-inch and one-foot buffers in the two sections of redesigned bike lane space will leave cyclists at greater risk of head-on collisions with moving cars and crashes with parked cars’ swinging doors. Cornish and Weeks did acknowledge that the lane does not conform with the 20-foot clear provision of the fire code, but said the rule is unreasonable. “We showed them that a lot of other cities don’t interpret the code this way and that it is contextual,” Cornish said. In his letter, Smith said the city was asked to look at other specific provisions of the code. After reviewing the lengths of the blocks, the size of the intersections and the parking limitations at the intersections, “there was still insufficient basis to support” the current configuration. Cornish said the city has redesigned many streets in recent years in ways that leave less than 20-foot clearances, including streets that contain reverse angled parking. To be consistent with “this very hard line” on fire code enforcement, as Cornish described it, the city would have to redesign those streets, too. First District Councilman Zeke Cohen made the same point in a video statement about Pugh’s decision. “I have to believe the brave men and women of the Baltimore City Fire Department can figure out how to fight fires on streets like mine which are less than 20 feet,” Cohen said.